Families all over the world view the kitchen as the heart of the home, as people gather to cook, eat, laugh, and create memories. With that in mind, it's no surprise that many homeowners design this room with extra attention and care. They want it to emanate beauty without sacrificing practicality, but are often limited in design choices due to budget constraints. Wolf Home Products strives to help customers find a favorable balance between quality and budget. As one of the nation's biggest cabinetry suppliers, we've used more than 175 years of experience to build our products in ways that offer top-tier quality at an unbeatable price. 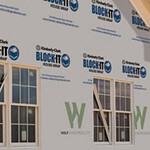 Our unique SmartShield™ Technology, offered on select Wolf Signature door styles, is one solution that's gained a great deal of popularity in recent years. We've taken our high-quality, affordable cabinets and added unparalleled durability, so your cabinets are prepared for whatever life throws at them. What Can Cabinetry with SmartShield Technology Handle? Raising a family and hosting large gatherings are often gratifying experiences, but they can also be demanding, messy ones as well. 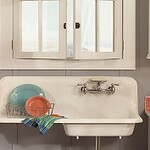 It's no secret that cooking meals, carrying dishes and opening and closing cabinets can create a lot of wear and tear. From paint chips to laminate cracks – even food stains such as spaghetti sauce – cabinets often struggle to withstand life's messes. Wolf's exclusive SmartShield Technology can assist tremendously with these everyday occurrences. It's an ultra-durable finish that closely emulates paint, so you receive the distinctive sheen without the difficulty of cleaning. Specifically, the finish consists of a specially designed laminate that wraps around the entirety of each cabinet, which helps to repel many familiar kitchen assailants. Resist heat and moisture: We've all spilled coffee or juice at some point or another, and know it ends with a sticky, often streaky result. With SmartShield Technology, you can simply use a damp cloth or sponge to quickly clean your cabinets. Heat and moisture are no match for this strong finish. Handle scuffs and bumps: Sometimes, an inadvertent kick or the action of an overly rambunctious child can leave noticeable imprints on your cabinets. This durable laminate can withstand these kinds of hits and won't peel or delaminate. Resist stains: In addition to the dreaded, aforementioned pastasauce, your cabinetry often falls victim to many other types of food, grease and grime. Cabinets with SmartShield Technology prevent residue from adhering deep into the laminate's particles, which helps make it easier to clean, and provide a high level of accident- and child-resistance. -The Livingston, which embodies a contemporary style with four different colors. -The Ellston, which emulates classic designs with crisp lines and a partial overlay. -The Elliot, a simple, timeless style that fits in anywhere with its three different colors. -The Carver, which features sturdy lines and finely detailed inlays to stand out. -The Emery, which takes on modern styles with dramatic design features. Download a brochure to view these great door styles or contact a dealer in your local area to see them in-person today!